The Keto Snack Pack is perfect for anyone on the Keto Diet. We carefully choose products which are compliant with the Ketogenic Diet. Your base product is a 14 pack of Cello Whisps individual snack bags (14 - .63 oz bags) in parmesan and cheddar flavors. Then you choose during customization any other products you want to add to your snack box. You can add no items or you can add 15 items... it's up to you. 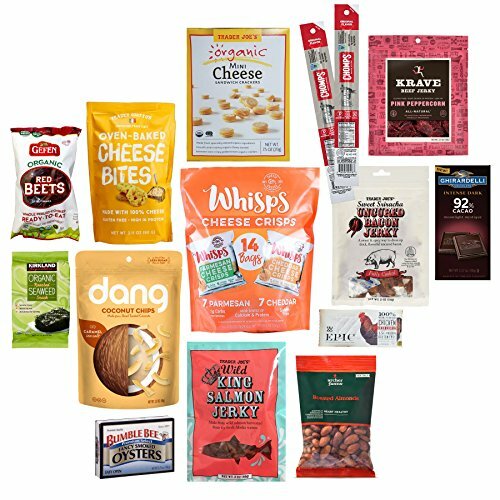 Custom Options: Oven-Baked Cheese Bites, 2.12 oz; Organic Mini Cheese Sandwich Crackers, 7.5 oz; Spicy Cheese Crunchies, 6.5 oz; Cheddar Cheese Sticks, 4 oz; Simply Lite Dark Chocolate, 3.5 oz; Montezuma's Absolute Black Dark Chocolate, 3.5 oz; Wild King Salmon Jerky, 3 oz; Epic Bar Bison Uncured Bacon Cranberry, 3 oz; Epic Bar Chicken Sriracha, 1.5 oz; Organic Beef Jerky Original, 3 oz; Sweet Sriracha Uncured Bacon Jerky, 2 oz; Chomps Grass Fed Beef Snack Stick, 1.15 oz; Seasoned Kale Chips, 2 oz; Macadamia Nuts Dry Roasted & Unsalted, 10 oz; Dagoba Organic Chocolate Extra Dark, 2.83 oz; Ghirardelli Intense Dark 92% Cacao Moonlight Mystique, 3.17 oz; Dang Coconut Chips Lightly Salted, 3.17 oz; Dang Coconut Chips Caramel Sea Salt, 3.17 oz; Epic Sweet Sesame Ginger Tender Chicken Bites, 2.5 oz; Epic Sweet & Savory Bison & Uncured Bacon, 2.5 oz; Krave Jerky (Various Flavors Available), 2.7oz; Vermont Uncured Pepperoni Turkey Sticks, 3 oz; Vermont Minis Original Beef & Pork Sticks, 3 oz; Mr. Cheese O's Cheese Snacks, 3.75 oz; Salted Roasted Almonds, 3.5 oz; Omega 3 Walnut Trail Mix - 10ct, 10 oz; Jalepeno Stuffed Olives, 4.75 oz; Garlic Stuffed Olives, 4.75 oz; GimMe Organic Roasted Seaweed Snack, .35 oz; Gefen Organic Beets, 17.6 oz; Bumble Bee Smoked Oysters, 3.75 oz; Season's Boneless Skinless Sardines in Olive Oil, 4.375 oz; Kirkland Signature Organic Roasted Seaweed, .6 oz; Kirkland Signature Solid White Albacore Tuna, 7 oz; Cello Whisps Parmesan Cheese Crisp, 9.5 oz. If you have any questions about this product by KETO SNX, contact us by completing and submitting the form below. If you are looking for a specif part number, please include it with your message. Dulcet Festive Gourmet Bakery Gift Box Includes: Walnut Brownie, Chocolate Cheese Brownie, Blondie Chip, Chocolate Chip Cookies, Peanut Butter Cookies, Great Gift Basket!